On 19 August, the Guardian reported that Venezuelans fleeing their country’s economic, political, and humanitarian crisis are being attacked by natives of neighbouring countries, who have grown weary of the relentless influx of migrants (a term that sounds increasingly euphemistic—’refugees’ is a more accurate descriptor). For nearly 20 years, Venezuela’s regime has blamed foreign actors and ‘neoliberal’ subversives for every woe and calamity that has befallen the country. But the disastrous results of the Bolivarian socialist experiment were both predictable and widely predicted—and not just by contemporary observers and analysts. They were also foretold 125 years ago by a now-obscure German politician, journalist, and author named Eugen Richter. Richter was what we would now call a ‘classical liberal.’ He appraised socialist doctrine before an actual socialist state put theory into practice, and he found it wanting. In 1893, he turned his concerns into a dystopian novella entitled Pictures of the Socialistic Future, in which he vividly predicted what would happen if the socialists of his day were to gain control of the German economy. Narrated by a devout socialist, the novel tracks the course of events as the party and its members labor to implement their utopian vision. The narrator documents the tragic consequences of the government’s policies on his family—his wife Paula, his son Franz, and his daughter-in-law Agnes. What starts as a joyous, popular revolution soon disintegrates into a socioeconomic nightmare, and the conflicted narrator, who initially resorts to excuses, finally has to confront the real reasons for the tragedy. Richter’s novel lacks the literary flair of Orwell’s totalitarian allegories. But it is impressive for another reason. History has revealed Richter’s political and economic insights about the inevitable fate of socialist experiments to be a warning of eerie prescience. 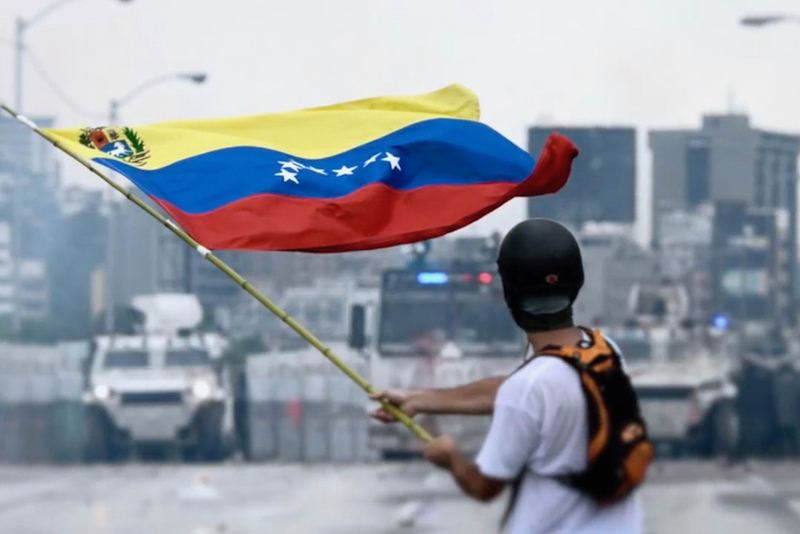 In what follows, I juxtapose excerpts from Richter’s bleak portrait of a socialist future with contemporary reports from Venezuela, drawn from a cross-section of media. To appropriate any human tragedy with the sole purpose of scoring political points against one’s ideological opponents is deplorable. The case of Venezuela is no different. Unfortunately, some opponents of socialism have been engaging in a ghoulish and gloating triumphalism. I do not intend to echo that sentiment here. Instead, what follows is an expression of frustration and anger. The unfortunate truth is that libertarians, centrists, conservatives, and liberals have all been sounding the alarm for a long time now, but have had their warnings blithely dismissed by ideological fellow travellers, even as an oil-rich nation has been plunged into an entirely avoidable political and economic catastrophe. It is long past time for some hard lessons to be learned. “While the opposition roundly criticized the new law when it was first introduced in October 2001, the real problems within PDVSA [Venezuelan state-owned oil and natural gas company] did not begin until Chávez decided to fire his appointment to the presidency of PDVSA, General Guaicaipuro Lameda, in February 2002 … Chávez replaced Lameda with Gaston Parra, a leftist economist and former president of the Central Bank of Venezuela. Also, he appointed five new members to PDVSA’s board of directors. Lameda, together with members of PDVSA’s upper management charged that Chávez was politicizing PDVSA by appointing individuals to the board on the basis of political loyalty, rather than merit.” The Economics, Culture, and Politics of Oil in Venezuela, venezuelanalysis.com, 30 August 2003. “Recent records show that 1.5 million Venezuelans have left the country since 1999. This number has only kept growing as Venezuela’s economy spirals out of control. Many Venezuelans aspire to leave the country since the highly politicized Central Bank has completely devalued the national currency, the bolivar, with its inflationary policies. But those seeking economic exile must also face capital and currency controls in order to leave in the first place. First implemented by Hugo Chávez in 2003, these measures were used to stem the capital flight caused by the 2002 oil workers’ strike. These capital controls started out as measures that targeted the rich in order to supposedly rein in their greed and their ability to move vast sums of capital abroad. History, however, has shown that regulations that start out solely targeting the rich eventually turn into all-encompassing controls that affect all social classes.” The Human Cost of Venezuela’s Capital Control Nightmare, PanAm Post, 18 February 2016. “A plethora of ostensibly pro-worker decrees have been passed in recent years, culminating in a 2012 labour law known as the LOTTT. The law includes a virtual ban on dismissals, a shorter working week and improved holiday and maternity benefits. In December, Mr Maduro renewed a decree, in force for the past decade, which makes it almost impossible for private firms to fire workers. Under the LOTTT, job security is virtually guaranteed after the first month. The result, employers say, has been absenteeism rates ranging from 15 percent to 40 percent of the workforce, depending on the industry and the time of year. Under these circumstances most firms are unsurprisingly reluctant to recruit. Luis Alfredo Araque, who chairs the labour commission of the main employers’ federation, Fedecámaras, says businesses are being bankrupted by unproductive workers: “I know one American company here, which is paying 250 workers to stay at home rather than come to work and cause trouble.” Labour-ministry inspectors refuse to approve dismissals, whatever the grounds, leaving many employers with no choice but to bribe workers to leave.” Labour’s Love Lost, The Economist, 25 January 2014. The conclusion here is, I believe, unassailable. Though an isolated parallel would be unremarkable, the extent and accuracy of Richter’s predictions about the trajectory of a socialist economy demand the attention of all intellectually honest observers. The grave economic and social problems we find in both fact and fiction are not merely coincidental—they are innate and native to socialist doctrine. Decades after Richter, libertarian thinkers like Ludwig von Mises and Friedrich von Hayek would build on the tradition to which he had belonged, and sharpen the economic case against socialism. And, as the century wore on, and the evidence of socialist doctrine became manifest in a growing list of corrupt, oppressive, and impoverished nations, public choice theorists elaborated on that critique. The result has been the construction of a scholarly, theoretical indictments of socialism supported by real world failures that, regrettably, are more often than not ignored or strawmanned by the radical Left. And so I urge socialists—both revolutionary and democratic—and leftists more generally to at last take this article as a signpost to the liberal tradition of critique. I encourage them to at least entertain the possibility that the long list of failed twentieth century socialist states were not simply socialist ‘in name only,’ or the ‘victims of circumstance,’ or co-opted by ‘reactionary’ or ‘counter-revolutionary’ elements— they were the inevitable and logical consequence of immiserating policies that trade short term gains to the poor for long term disaster. History does indeed show that! The question is why have so few failed to learn it or choose to ignore it? Excellent article though the verbiage about not trying to sound like he was saying “I told you so” was unnecessary and out of place. Well to be exact, they effect all classes except the political class. The power brokers being exempt of course. Chavez introduced foreign currency controls, which eventually led to enormous corruption (hard currency was only allocated at official rates to regime kingpins who then dealt it in the black market). Maduro extended them and choked foreign investment. Chavez introduced labor controls which made it almost impossible to fire workers. This made it hard to justify hiring, so we turned to short term contracts to avoid having permanent employees. Chavez implemented a system to control food movements from the producers to the markets. This led to inefficiencies and huge amounts of food rotting before it could get to the retailer. I would have to review several years’ worth of documents and emails to list item by item the way Chavez and Maduro strangled and destroyed the economy. I would add that they were being advised by Spanish marxists such as Monedero, Iglesias, Serrano, and others who came out of a Valencia Institute which got funds from Venezuela, and by the Cubans. I saw what went on in Venezuela from 1999 until now as a repeat if what happened in Cuba under Castro. They are such fanatics they never consider the whole system is wrong, doesnt work. I doubt any democratic socialist are going to read this and change their mind. It was worth a try though. Socialists today are entirely free to entertain their faith just as religious people are. That is, they can open free/cheap restaurants, hotels, apartment buildings, and create companies that treat all employees the same, give them all that they need, etc. It’s called club membership and they can do it now with all who are true believers, and even then, you’ll find they won’t try because they know the abysmal results they’ll have in comparison to the free and equal individuals. I am a democratic socialist. I am also familiar with the economic theory of socialism and with the entire economic literature on socialism for the last century or so. Moreover I have been following the Venezuela crisis for years. As I explain beneath, VENEZUELA HAS NO PLAUSIBLE CLAIM TO CALL ITSELF SOCIALIST, at least in the sense of having a planned economy. Consequently critique of socialism, whether accurate or not, is irrelevant to the Venezuela issue. The simplest proof that Venezuela is not and has never been a planned economy is the fact that as Venezuela’s petrodollar revenues rose between 1995 and 2010, the land surface devoted to farming shrank swiftly. This is a typical market reaction to increased food imports. A planned economy would never react that way. Read the articles on Venezuela by Venezuelan economist Ricardo Haussmann. As far as I recall, he makes noo mention of “socialism”. The individuals who have ruled venezuela call themselves practitioners of “21st Century Socialism”. They are marxists, they have implemented socialism under advice from outside experts, and have failed. You too will fail if you ever manage to take over. But you will also cause pain, death, misery, injustice and possibly even genocide and war. By the way, “democratic socialism” seems to have been coined by East Germans who regrouped after the fall of the USSR. You are being fed dogma, and are simply repeating the same excuses I’ve heard them use for decades. How you call yourself, Fernando, is not that important. A lot of activists and politicians called themselves Marxists, without even having read his voluminous works, and without having appetite to read abstracts of it. They say they are socialists, they do what socialists do, they are corrupt and murderous as most socialists have been, they base their ideas on the same fallacies and stupidities socialists do. The consensus we have in Venezuela is similar to what other people who have suffered that monstrosity has been. Its a deadly dogma, sokd to the mentally weak and ignorant by ivory tower intellectuals who dont understand much about real life. A good criterium of whether a nation is democratic or not is the existence of (reasonably) free elections. With this criterium at hand, East Germany (or neighbours eastwards, and Cuba or course) was not a socialist democracy, but Venezuela yes! Even if you deny that with both hands (as bolivious does). The simplest proof that Venezuela is not and has never been a planned economy is the fact that as Venezuela’s petrodollar revenues rose between 1995 and 2010, the land surface devoted to farming shrank swiftly. FAO in forms us that Venezuela’s area devoted to crops increased by 20%, from 1.698 million hectares to 2.045 million hectares. So, by your logic, Venezuela is a planned economy. But, gringo, you yourself had doubts about these figures, FAO just writes down (like the lizards in Alice in Wonderland) what the countries, trustworthy or not, report. I also have my doubts. Also, the area under crops or cattle is not so important, the productivity only is what counts (in the NL, 1 ha of wheat= 10 tons, in Australia 2 tons). In the NL, a very small country, we also have 2 million ha under crops and grasslands, unbelievable, Venezuela is about 30x as big as we are. Why not do more with your land? Gosh, gosh! But, gringo, you yourself had doubts about these figures, FAO just writes down (like the lizards in Alice in Wonderland) what the countries, trustworthy or not, report. Did you bother to read the Gustavo Coronel link I provided? (Not the first time I have asked you this question about a link,) Gustavo’s objection was to the FAO’s representative in Caracas claiming circa 2015-6, well into the drop in the price of oil, that Venezuela had this great food supply and a great government policy.When 70+% of Venezuelans reported losing an average of 9 kilos in 2016, that FAO claim didn’t sound so good. Gustavo Coronel’s objections were NOT about FAO production or land use statistics, which is what you are objecting to. If you look at the FAO’s page on Venezuela, you can see some of that water-carrying for Chavismo- some of Gustavo Coronel’s objections- as in Average protein supply (g/capita/day) (3-year average), there is no data past 2011-2013.But one can also note that the same FAO page on Venezuela shows a 50%+ drop in Cereals production from 2014 to 2016. I am repeating myself -because the message apparently hasn’t gotten through-but recall this Carlos Machado Allison quote. According to my calculations, which are quite adjusted to those of Fedeagro and the rest of the guilds, in 1998 the vegetable agricultural production was 780 kilograms per person per year, and in 2016 it was 500 kilograms. That would be a decline of 35.9% in vegetable agricultural per capita production. (vegetable as in non-animal) Compare FAO gross Crop tonnage for Venezuela from 1998 to 2016. I am taking out sugar cane production, as it has an out-sized influence for two reasons. 1) It accounts for about half of gross tonnage and 2) sugar cane production crashed. I am substituting in raw sugar production instead of sugar cane production. While these kilos of production per capita from FAO data are not the same as those used by Carlos Machado Allison – he had 780 for 1998 and 500 for 2016, the percentage drop is quite similar: 34.1% drop in per capita production for FAO data (raw sugar instead of sugar cane) versus 35.9% drop according to Carlos Machado Allison & Fedeagro. Which informs me that FAO production data is fairly accurate. Which also informs me that FAO land use data should also be fairly accurate. In additionbolivious made the completely undocumentedclaim that that from 1995 to 2010 “the land surface devoted to farming shrank swiftly.” FAO data shows to the contrary, and gross (summed up) crop tonnage also shows an increase from 1995-2010- which supports the FAO land use data. Why did you not object to bolivious’s making a completely undocumented claim? Overall , I will go with FAO documentation, imperfect though it may be, over bolivious’s completely undocumented claim. BTW, while cassava data is quite possibly incomplete, why would the degree of incompleteness be all that different for 2016 compared to 1998? So, you think FAO is right in their figures on agricultural land(official? provided by? ), and Oblivious’ one is wrong, in fact, not so relevant who is right, I think. The area “devoted” to crops doesn’t say much, production does. In a land with only 11 or 12% rural population, this can only mean a large shrinking of arable land, unless the scale of remaining holdings, or the productivity has increased substantially, which I doubt is the case. Also not necessary, because most of the beans and stuff are imported with petrodollars (until quite recent at least), even Chavez had to admit so(see my comment below). Since the Charcote ranch has been sold and distributed amoung plotholders, the area devoted to crops most probably has increased, but the production decreased (because of flooding, the land was for cattle grazing, not suited for crops, so, bare maize stalks on the field and no cobs and grains). This is one case, but how was this elsewhere? The national situation since 2005 was completely chaotic, figures here (Fao, Carlos) don,t help much. And, I must admit, I seldom read links, sorry! What we are witnessing in Venezuela is nothing but one of the latest episodes of “left-wing ideas vs. real life”. They real-word experiments that split Germany and Korea and Vietnam into two, one socialist and the other capitalism, and the results are plain for all to see. Poverty isn’t genetic/racial, but socially constructed by bad cultural reasoning. Something I can’t understand: why do Venezuelans flee their country, or stay in the cities, and don’t flee back to the rural areas, to some family farm or piece of land of grandparents. With very little work, you can produce there all the potatoes, cassava, bananas, chickens, goats and pigs you want, no problem, I have some experience with it (to live a luxury life with self supportance is another chapter, but now it’s on kilos of rice, beans and pork for millions and millions of pesos, unbelievable, and what great chances for small enterprising peasants all of a sudden). This is what happened in a massive scale in Peru during crises (own experience, in the ceja de selva), and now again in Greece, where the farm population in the last few years grew from 13 to 17% (and if the farmhands would be counted also, much higher). Socialism has much to do with te flight of people from the land, to the cities and factories, Marx knew this already. Being an agronomist, I would be very obliged to have some response here from knowledgeable persons on the issue. Thanks in advance!! Most of the people leaving Venezuela lack money to travel far, or they cant get a visa to enter europe, so they dont even get on a plane. Many cant get passports. The flow is mostly into Colombia, from there they go to Ecuador, Peru, Chile and Argentina. Many have walked all the way from the border to Lima, Peru. Your perception is a bit distorted. Im trying to help people escape and it gets complicated because most countries in the region are filling up, or deny entry. In Brazil theyve been attacking Venezuelans at Boa Vista, and the government just ordered troops to move north. And then theres diseases. Venezuela has had almost no vaccination, so there’s lots of diseases, and people heading out are a health hazard. Its bad. As stated in the article, the state controls the land, and also controls the means of distribution, so there are no incentives to farm crops, as opposed to Greece which you cited where state doesn’t control the factors of production. Indeed, plus farming is very hard work and rural isolation tends to breed poverty and lack of education and worldly understanding. Thanks Sagesse and Peter: yes, if these guerillabands are all over the place (like they were in neighbouring Colombia), I would understand, but is that really the case? Incentives to farm you don’t need if you farm for yourself (this is what I meant, and saw in rural Peru during crises). On a visit in Curacao, all vegetables, fruits, black beans,green maize cobs bananas and root crops for sale there were transported (smuggled?) by small boats from Venezuela (only a few miles away), for quite reasonable prices. I wonder, for those astronomical food prices now, whether they still sell their produce there, better at home now, I would say! Indeed, Dirk, hard to tell how present are the guerrillabands in rural area, but sure, probably is not that relevant. Those accounts were mostly near the colombian border at Apure and Barinas states. Indeed, a better explanation why so many left is a general disassociation with rural life. As the rural exodus happened somewhen on the 1910s, and much of the middle class was formed by 2nd or 3rd generation venezuelans with deep connections overseas. So many moved back with to their grandparents and other relatives homes, they just happened to be outside the country. Yet it doesn’t fully explain why is there almost no movement within the country, at least that we heard of. All that comes to my mind at the moment is the lack of infrastructure connecting the rural interior with the urban coast, which is almost non-existent consisting of only a few two lane roads; as well as the current government’s reputation of expropiating everything on sight; as well as siding at court with “invaders” who ilegally settle on other people’s property, as it happened in the now infamous “torre de David”. Yes, Peter, where is the rural interior? In the views and reports on Venezuela? Mostly, you see only street scenes and bridges full of fleeing people. In the deep south, the last indigenous, these Yanamamo, are probably living their isolated life, with every day a balanced diet of bananas, fruits, cassava, fish or some wild, but elsewhere in that giant fertile country? What Newman forgot to tell in his enthousiastic tale about the dangers of socialism, is that, like in all Latin America, this land, until rather recent, was in the hands of just only a few socalled latifundistas, the rich landlords with 1000s and 1000s of acres and a workforce of half enslaved locals. Why not mention that? Chavez installed new land laws, in the (false?) hope to change this, with the logical results of the landless recuperating the unused parts of the landlords, but also, of course, the properly farmed areas. result: backlash of paramilitary forces from the landlords, as happens in Brazil. Newman mentiones libertarian author Richter, and the libertarians Mises and Hayek. I wonder what these libertarians would have said about the land reforms and rural production situation as launched by Chavez and Maduro. Somewhere I read: the overwhelming reliance on oil revenues determined all productive (especially rural, Newman said it already, not distribution of food is the problem, but production), and the general socio-economic development. No Latin American nation has such a high urbanisation as V., and that already early-on. Poor Venezuela. Dirk, there are no “guerrilla bands”. What we see is organized bands of jackers and looters. They are gangsters and have no relation to organized communist guerrillas operating in Colombia, which are extremely well armed and have links to the chavista regime and the Cubans. Your proposal is unrealistic. Even if it were possible, theres no seed, no implements, city folk know nothing about farming, and they would have to wait several months for crops. Guerrillabands were the words of Peter, of which I (and Peter himself) doubted the relevance, though, at the border of Colombia that might be different due to FARC’s movements. What I read was that more than 100 peasants were killed by unknown forces, but probably supported by landlords that were afflicted by land appropriation. And please read what I said about city folk as farmhands earlier on, that was no theory, I know this kind of people from Peru, I spoke to them, I saw them at work, and I am sure that Venezuela has some, or many of them, like is the case in Greece. There is no doubt that in time of food shortage country people live better than city people. In Europe, it was true during both World Wars and in the following years. However, ot does not mean that moving from the city to a subsistance-based country life is easy. Even in a country where subsistance farming is easy, it requires skills and knowledge most city dwellers lack. While you can acquire them, it takes some time. On top of that, you need available land to farm : either arable land nobody else is using ( not likely if you don’t own it) or wilderness area to clear yourself. Unoccupied lands may not lack in Venezuela but they probably aren’t easy to reach for people from Caracas or another big city and clearing them would be fairly hard work. On top of that, if you don’t follow the local legal procedures, you run the risk of getting your farm confiscated if you don’t bribe the relevant officials. In a socialist country like Venezuela I don’t know if it is easy to get a land lease and how much of your crops you are allowed to keep, even if you are only trying to farm for your own subsistance. Also, when things get really bad, an isolated farm is fairly vulnerable : think of what happens to the white farmers of South Africa. I have read that guerilleros from Colombia have moved into Venezuelan territory, even if it is not true, Venezuela is already a very violent country. Another problem would be the mentality of the people : not everybody has a pioneer’s spirit and would be willing to make such a change of lifestyle, with all the risks that come with it. We should not forget that until not so long ago, Venezuelan people enjoyed very high standards of living : going from that to subsistance farming might be unthinkable for many people. Going back to the land might be easy for people who have kept a link with it, relatives with a farm who can support them until they can settle in good conditions, but for everybody else it would be much more difficult. Thanks Emmanuel, good points. My experience, nevertheless, is that if city-life and soaring prices make life difficult (and, better believe it, is close to a war situation there, as we had in the NL in 1944, people dying from hunger, golden times for the farmers) then many go back to some relation, old friends or family with a piece of land, somewhere far from the city. They help with simple land work (weeding, picking, harvesting bananas, maize cobs or cassava and carryng them home, winnowing and cleaning beans ,feeding chicken or swine) and are fed in natura by the farmer. I know such people from Peru, and must think this was quite common then and there, though you never read about it in the media (in that Peruvian mountain village, never even an official or journalist showed up). But, you are right, if the political situation, title deeds,corruption, safety, does not allow, everything stops. In Greece, as I said, the people that returned to the land were only those with relatives with a piece of land (yet quite common there, the old ones that never left). I have the idea that unused land is no problem in Venezuela. The article mentioned the partnership with Brasil with that MST, Landless Workers. In Brazil, this MST is quite successful, so far as food security and self supporting for the poor is concerned, not for much excess to the towns and cities of course. Writing this, a lot Latino memories come back, it was a rich time, in poor countries! I have no idea of what the economic situation of rural Venezuela looks like but I would be very surprised if food shortage were anything like what is happening in the cities. It would be interesting to check how their agricultural and land tenure systems work. While “unused” land is plentiful, I don’t know how easy it is to legally get a plot of land to farm for yourself : without legal tenure or property, you are at the mercy of anybody in position of authority. Poor people are starving in rural venezuela. Theres no “unused land”. The government has taken land, doesnt farm it, but its impossible to invade it. In venezuela we use a term, “invasion” for when people go take land. The invasores are likely to get shot by the landowner, which can be a small farmer unable to farm due to lack of seed, or implements. Ive seen areas where they cover roads with two men with shotguns to stop invasions, or looting (anybody walking down a country road is considered a would be looter or eyeballing vehicles for hijackers). The author may have mentioned Mises and Hayek, but he has never read them, unlike me. At no point does the author explain his reasons for calling Venezuela “socialist”. Consequently he is merely a smugnoramus who uses the case of Venezuela to propagate antiquated flea-market ideology. Venezuela is ruled by individuals who call themselves socialists (some like Maduro are communists). Their party is the Partido Socialista Unido de Venezuela), they believe in nationalizing land, claim to be for social justice, the poor, say they hate the bourguesie, are admirers of Fidel Castro, use red as their color, implement central controls, took over all media, use censorship, have destroyed the economy, are arbitrary, and app,y torture on prisoners. They behave like socialists elsewhere. And please dont come back and tell me about Sweden. The swedes are moving away from socialism, but its probably too late. I dint think most Swedes will live in Sweden in 50 years. It’s a plan. And many Venezuelans have done that. It gives at least some security against starvation, for those with access to rural land. BUT….a life in the country isn’t autonomous. You still need electricity, fuel, spares, medicine, and a thousand other small things you can’t produce “on the farm”. How will you get those? When the nearest market is half a days travel away and empty most of the time? When you can’t sell your surplus? Or are paid only in worthless money? You also can’t secure yourself from the growing violence. You have food worth stealing? Well, then, you had best arm and secure yourself at night; isolated farms make good targets for armed thieves. Finally, living in a rural area is no security from the state. You have no guarantee that your land won’t ultimately be appropriated and given to supporters of the regime. Eventually you may find yourself forced out with nothing. It’s clear Alistair that you have not the slightest idea how small peasants in Latin America (and elsewhere around the equator) live. Electricity? Spares? Fuel? For let’s say 100 million peasants unknown and unnecessary things. But I am not surprised, none of my friends can imagine that beyond Europe and the US life is completely different. Maybe, I also wouldn’t have believed, but I happened to have lived in a mountain village in Peru (as botanist for a company), without electiricity, spares, roads, streaming water (there was a rivulet close to the village), cement, or newspapers, if sick, I had to fly by Cessna to a town nearby. Very comfortable, after all, because never sick. Of course, such people have a low income (they are all self sufficient, but earn some cash with surpluses of beans, chicken, swine), but the problem in Caracas is almost a war situation, no food, hunger, and then no more need for electricity, medicines and spares (for machines? tractors?, you really don’t need that if you have a hoe, an axe and a machete).Still, I got no sensible answer on the question: why not overcome this difficult period by staying on the piece of land of relatives somewhere far from that damned Caracas? ?, and wait for better times! I would have done that, with pleasure. Though, it’s true, in case of dangerous situations, lack of safety (guerrilla, corrupt officials) I also would not, so, I.m still waiting for somebody who knows the rural situation better, and tells me more about that, I can’t find it via Google. A friend of mine with a small farm in rural Colombia had to flee to Bogota for some years because of FARC, so, yes, can be problematic. Dirk, you are perfectly right : all over the world there are plenty of people leading a subsistance-based lifestyle without all the commodities most westerners would find necessary for survival. That kind of existence should neither be idealized nor looked down, and in Venezuela, right now, it sounds much better than life in a city where there is no food and no electricity but plenty of trigger happy looters and soldiers. Since foreign journalists have little access to Venezuela outside of the big cities, that kind of migration may already be happening without many outsiders noticing it. One more explanation might be the lack of infrastructures which would make city to empty rural area migrations easy : for many people the neighbouring countries might be more accessible than distant rural areas. Yes Emmanuel, you know at least something, because of your stay in French Guyana, the bridges with fleeing people we know from the media, because the journalists are there, (they must be back before evening in their luxury hotels in Caracas or other city to write down and mail what they saw that day), but what really happens there, the people that wander, flee and (maybe?) work on the small farms far away from everything (civilized), that’s completely another matter, we will never know, unless some crazy (western) bushcrafter informs us. The bulk of venezuelans arent peasants. Many of you just dint understand that it has been a rich country. Has a very large urban population. My suggestion to Dirk is to come on down and see if you can teach Venezuelans how to turn into proper south american peasants. Cubans and Vietnamese (friends of Chavez) did that Fernando (at least, I read so), but I wonder whether they came with good advice. The Vietnamese I trust most, where it comes to irrigation, planting, weeding and harvesting of rice. So lets say you live in Caracas, are a mechanic, have a wife, two children. Exactly where are you goung to go? To Portuguesa, where the farms are fallow because theres no seed, and farmers who are still around cant get product to market because theres highwaymen stealing everything? Thats very romantic, but you simply have no idea. pesos must be bolivars, of course, there is, after all, some difference in latin-american nations. You could have written this piece without a reference to the “classical liberal” revival. I must assume that the support of far right-wing capitalism is your main intent here. In the US, the corporations now have control of just about everything and everyone, and things are more of a mess than they’ve ever been in my lifetime. The truth you want to ignore is that a mixed system along the Swiss or Danish models would result in the most economic and social stability. If there is any real tragedy occurring from corporations, it’s the fault of government siding with them rather than ensuring liberty, equal protection and ensuring those who create harm (externalities included) are protected by government choosing of winners and losers. You are never forced to buy from any corporation, but you are forced by whatever government demands. Bradd, I’m not sure how flagging the fact that Richter would today be described as a classical liberal constitutes referencing some classical liberal revival. I’m also not sure how criticism of Venezuela’s government can lead you to believe that the author supports far right-wing capitalism, or that he wants to ignore anything about mixed economies. May I suggest that you are irrationally projecting views here? Perhaps also consider some charitable interpretation. First it was Scandinavia = socialism and now it’s “classical liberal” = far right-wing. There’s no lie too low the intellectual Huffpost reading progressives won’t stoop to use. BTW, the Swiss model of 8.5% federal corporate income tax, personal income tax varies from a bracket of 1% (for single tax payers) and 0.77% (for married taxpayers) to the maximum rate of 11.5%, VAT is either 2.5% or 7.7%, property tax is from 0.3 to 0.5 per cent, and no minimum wage. If you’re appealing for that, then sign me up. Of course, Brad, a mixed system may well result in economic and social stability. But in the absence of this Utopian fantasy I would argue that a Capitalist system, which we have the relative freedom to accept or reject is far superior to a centrally controlled governance, masquerading as Socialism. Wouldn’t the scandinavian states or the netherlands be a model for mixed systems? The truth is that Swiss are capitalists. I believe Denmark is a strategically located small nation with a small population. And in any case, any move towards socialism such as they had in Sweden 30 years ago would be out of the question. The swedes cant even afford that, and the latest polls show the majority is leaning center to far right (and thats in spite of decades of brainwashing). Yes, Scandinavian countries have been the subject of so much confusion and mixed messages in the U.S.
Basically all of Scandanavia is based on a market capitalist system. Norway leans a bit more statist as it sits on heavy oil reserves that are state owned (much like venezuela, hmmmm…) but the rest of the economy is market based. All of these countries have high income, vat & sales tax to support a heavy welfare system. I repeat, the economy is a market based system with high taxes across all income brackets with a very expansive liberal welfare system. In Sweden the unions have a central role in working with the corporations to support wage incomes and all the negotiations that go along with the union / employee sector. This worked quite well for a while for most people. From the research I’ve done, even when they couldn’t taken extensive time off most didn’t. It seems the Nordic countries have an excellent work ethic and high trust in their government. However, this is being pushed to the point of collapse with the mass migrant crisis of 2015-2017. I believe all of these countries have been affected somewhat but Sweden has been taxed to the breaking point. They took in more migrants per population than any other country and their only a country of 10 million so less than a third the pop of Cal & Texas. The migrant issue has caused a heavy burden on their welfare system and they have had to make cuts and the violence has caused division in their society that they’ve never had to deal with before. I’m afraid the migrant crisis may make the Nordic model a thing of the past. Bradd, support your argument please. His logic points to small countries, with mostly homogenous people and certainly a homogenous culture, and that are all starting to suffer as immigration increases (where the culture is no longer shared) population and interpersonal conflict. They ignore the reality of all other such “natural” experiments where we split Germany, Korea or Vietnam….or even western vs. eastern Europe, or North America versus south/central. People calling for the end of “socialism” again because of the Venezuelan example are like people calling for the end of “capitalism” after 2008. There has to be a mix of policies. What is most successful will depend on a particular mix in a particular nation. Anyone over the age of twenty should have pretty decent exposure to the excesses of both sides by now. What side you inveigh against will hinge on what side you think is more in danger of ruining the world, and that comes down to completely contingent personal biases. We need some subtlety and sobriety when we talk about these things. It was always clear to anyone in the middle like myself who supports a somewhat intervening state that this country was going to go to pot. If you didn’t think that you were not a social democrat or maybe not even a socialist – you were just a moron. In 2008, you had none of the serious consequences of Venezuela, and that’s with a government that’s both corrupted to protect corporations over citizens, while also handing out social goods like never before. I agree, Treat W., and that especially counts for the countryside, the farm community. Where other rules and needs reign as in the cities, though, these cities often determine the rural policies (not always for the good). People calling for the end of socialism are 100% correct. Socialism is an evil creed. How much evidence do you need to understand that? The fact is that modern, western democracies never descended into socialism. They all adopted some socialistic policies, but overall they allowed the private sector to generate the wealth necessary for a healthy economy. On a few occasions socialistic policies have nearly ruined western democracies. The most famous example would be the UK, where nationalisation of industry and huge subsidisation of private sector wages led to near economic collapse in the 70s. What i do know is that “democratic socialism” is used by German communists from Die Linke. I suggest you visit the webpages put up by the Rosa Luxemburg Institute in New York, and check their German pages. What you will see is communists who used to enjoy torturing people, and are now selling marxism as “democratic socialism”. Its back to Stasi days if they take over. Trust me, I’ve spent decades studying them. I know of other countries relying on oil or a single export crop (Cuba on sugar, Nigeria on oil) where production of staples and simple food (rice, beans, maize, chicken) was consequently abandoned, because import was often cheaper, peasants stopped farming and came to the cities, but there are also other disturbing things brooding now in Venezuela, obviously. 2. By 2008 they had cut it to 38% to GDP. 3. In 1994 the government also began cutting government spending by an average of 3% per year for the next 10 years. 5. These cuts were aimed primarily at healthcare, along side simplifying taxes. 6. It’s important to note that cuts do not necessarily result in a drop in quality of services. 7. In response to the recession, Sweden also cut taxes across the board. 8. Sweden’s banks are not nationalized. 10. Saab was not “Too Big to Fail. Just to name a few examples of how capitalism is alive and well in Sweden. I suspect most socialists or social democrats would not support the reforms enacted by the Swedes. Have you ever met a Swede? It goes against every strand in their DNA to inconvenience others or be a free loader. On top of that they have a bulletproof work ethic and unassuming temperament. America, on he other hand, is peopled by a whole class of historically aggrieved groups who believe society owes them a free ride. THIS is why socialistic policies that seem to work in Scandinavian countries will NEVER work in America. There are simply too many people here more than happy to live off of other people’s hard work without once considering that they should contribute something themselves. With the slightest influx of immigrants from the south, Sweden’s generous social policies will collapse precipitously. Much of below is taken from Ronald Fraser’s Blood of Spain: An Oral History of the Spanish Civil War and Burnett Bolloten’s The Spanish Civil War: Revolution and Counterrevolution. Bryan Caplan of George Mason University did the tough slog putting it together, and I’ve excerpted some of the parts about workers’ control. Socialists and Anarchists often mention Barcelona, Spain as an example of their theories working… until Franco defeated them. If not for the fascists a genuine workers’ utopia that had been established would have thrived and been the example to follow. Writes the Democratic Socialists of America: “We believe that the workers and consumers who are affected by economic institutions should own and control them. Let us now read of how people’s ownership and control was implemented and experienced. Keep in mind the means of production had been seized; there was no compensation provided to the former owners, so the workers weren’t starting with deficit. In October , the government of Anarchist-dominated Catalonia passed the Collectivization and Workers’ Control Decree, which legally recognized many of the de facto collectivizations. So, 30% would be kept by the workers for pay and non-pay “social needs” benefits. The 50% tax was to help support the struggling workers’ collectives. More importantly, there was a huge loophole – firms had to pay a percentage of their profits. To eliminate the exaction, one merely need eliminate the profits. With worker control, there is a simple way to do this: keep raising wages until the “profits” disappear. Taxes on profits – which is what the Decree amounted to – will raise revenue if the workers and the owners are different people; but with worker control such taxes are simple to evade. Witness after witness reports the abolition of piece-work, improvement of working conditions, lavish non-wage compensation, and so on. “‘It came as a psychological shock to some workers to find themselves suddenly freed from capitalist tutelage. Exchanging one individualism for another, they frequently believed that, now that the owners were gone, they were the new owners. In short, after being told that the workers now owned the means of production, the workers often took the statement literally. What is the point of owning the means of production if you can’t get rich using them? But of course if some workers get rich, they are unlikely to voluntarily donate their profits to the other members of their class. This seems elementary upon reflection, but only practical experience was able to reveal this to the economic reformers of the Spanish Revolution. “‘Individual collectivized mills acted there from the beginning as though they were completely autonomous units, marketing their own products as they could and paying little heed to the general situation. It was a sort of popular capitalism…'” How, one might wonder, could avowed socialists act so contrary to their principles? The workers’ behavior was not particularly different from that of wealthy Marxist professors who live in luxury while denouncing the refusal of the West to share its wealth with the Third World. Talk is cheap. When the worker-owners had the option to enrich themselves, they seized it with few regrets. The simplest way that the collectives could have avoided dependence on the government would have been to issue debt; in short, to borrow from the general public rather than the government. But undoubtedly the fear of revealing surplus wealth to lend would make such a scheme impossible. [The Anarchists and Communists had been running around attacking and even murdering those they deemed capitalist or bourgeoisie, anyone the people believed to be supporters of the Nationalists. In most cases, these supporters had taken no specific action to assist the Nationalist rebellion; they were singled out for their beliefs, or what people guessed their beliefs were.] Even if their physical safety were not their concern, investors could hardly expect to ever get their money back. The insecurity of property rights thus made it very difficult to borrow from the public, so the collectives mortgaged themselves piece by piece to the government until finally the government rather than the workers owned the means of production. Only a minority understood that collectivization meant the return to society of what, historically, had been appropriated by the capitalists…'” In other words, most workers assumed that worker control meant that the workers would actually become the true owners of their workplaces, with all the rights and privileges thereof. Only the elite realized that worker control was merely a euphemism for “social control” which in turn can only mean control by the state (or an Anarchist “council,” “committee,” or “union,” satisfying the standard Weberian definition of the state). Inequality existed within collectives as well as between them. Invariably, the participants attribute the tolerance of inequality to the fact that it was impossible for one collective to impose equal wages unless the other collectives did the same. If one firm refused to pay extra to skilled workers, they would quit and find a job where egalitarian norms were not so strictly observed. Many workers took the slogans about worker-control literally. They overlooked the possibility that these slogans were intended to win their support for a revolution to replace capitalists with party bureaucrats. “They overlooked the possibility that these slogans were intended to win their support for a revolution to replace capitalists with party bureaucrats.” Time and time again this is what’s occurred. The liberators of labour over promise and under deliver because the true goal is not to give control to the workers, but for a group of ideologues to seize power for themselves because they are more deserving. It’s happened every time. And the liberated workers are the ones made to suffer most after the state’s enemies are murdered. Thank you very much for this information. Really useful. My father’s family came from La Rioja, the premier wine region upstream from Cataluña. Ive heard stories from relatives, read books, and lots of webpages. I’m not going to use these pages to debate the Spanish Civil war. But i can tell you my mother had with her the photograph of her cousin, who had left Cuba and gone to Spain to become a nun, was captured by communists, raped, strangled. My mother told me that the men who did it were led by a woman they called Dolores, and that later most of them had been killed by Franco’s troops. Which of course was fine with us. That was the period called the Red Terror. The evil reported by eyewitness accounts of it are beyond comprehension – using clerics’ skulls as footballs, for example. From 18 July 1936 to 1 April 1937 no fewer than 6,832 priests, nuns, and other religious people were murdered for their faith. Not content with that, the leftists and anarchists disinterred corpses of nuns and priests from their graves and put them on public display to be profaned and desecrated. They also dug up children’s bodies and put them on display with the bodies of nuns, telling the people that these were the nuns’ secret children, whom the sisters had murdered to conceal their sacrilege. That may be Dolores Ibárruri. British historian Antony Beevor writes of her many claims to infamy one included her biting the jugular of a priest to bleed him to death. Beevor says 40,000 murdered civilians including clerics, nuns, and other religious people by the left is a credible number. One of the best histories of the Red Terror is Jose M. Sanchez’s, The Spanish Civil War as a Religious Tragedy. He disputes earlier apologists of the left who claimed the violence was spontaneous. Sanchez found the terror unleashed against the Church was planned, it continued much longer than what can be deemed spontaneous, and it was viewed positively by most on the left as well as the anarchists. In reality anticlerical violence was a PR disaster for them, both domestically and internationally. In the end, Franco won. In Santiago I walked through a Franco street, forgotten to change the name. Very few there like to be remembered at the horrors of the civil war. Maybe some elderly and religious ones. The exact name of the street: Rua do Franco! Just imagine! I always scroll down to look for your comments ga gamba. I hope to see you publish here one day. Thanks very much for this read and all the others. I’ve read a lot around the internet the false claim that fascism defeated the “libertarian workers paradise in Catalonia”. It’s a pretty bad falsehood I wish would go away. CNT/FAI and their allies were actually defeated in the “May Days” of 1937 by the partisans of the Second Republic and Soviet-allied communists. In fact one of the factors that prompted the Soviets to get rid of the anarchists was the severe underproduction of their factories. Catalonia was the biggest industrial center in control of the Republicans and they badly needed it to produce tanks, guns, ammunition and etc to the war effort. But the Anarchistis, by destroying the rational management and structure of most factories severely damaged the capacity of delivering those goods, All the while, Franco transformed the industries in the Basque region into a very efficient part of his war machine. That’s interesting Lenny, bien etonne de se trouver ensemble, the Sovjets and Franco on one line for an efficient and productive war industry. Yes, maybe not so funny, Stalin, Franco and Hitler, all 3 of them, all in favour of that Industrial war machinery, at the cost of much human suffering of course, but who cares, quite logical, if only you start memorising! And, Lenny, it’s not at all as what I read about the libertarian succesful Catalon society from that fierce madame Emma Goldman. I disagree. Moral arguments win the day and illustrating loudly, vociferously, and saliently the moral horrors of socialism in practice should be on the agenda of every non-socialist in the world. It is the lack of strong moral argumentation that has the NYT Op-Ed stanning for socialism. This should be reversed by illustrating the realities of socialism as often as possible. Think Pro-lifers posters at an abortion clinic, but instead, pictures of starving children, malaria rates, etc outside of every socialist meeting place in the West. Dirk asked : Why Venezuelans do not leave cities and start cultivating land, as quite a number of Greeks did in recent years (a very interesting fact). Well, what is the point of toiling on the land if the socialist government can come and tell you: you have to prepare a ton of potatoes next month, and we will pay you a very low price for it. We will also seize another 500 kg without paying, because we think you got too much. If you do not comply, you will go to jail. It is called »solidarity« with the city folk. This was actually done in some Socialist republics in Central and Eastern Europe for about six years after WWII, often leaving the farmers and their families with little to subsist on. I listened to a woman whose parents were struck on the floor by the Militia and kicked in the face, as they were suspected of hiding food. Besides, where will you find a spark plug for your cultivator or spare parts for the water pump in socialist Venezuela? Even basic necessities of life are missing. Greece is quite a different place: a market economy with retail functioning, and private property protected. Greeks are also very good and industrious at agriculture: I marveled at their neat olive orchards. I remember a schoolgirl on the bus who proudly told me the number of olive trees her family had. The best dried figs come from Greece as I learned. More people would stay on the land in Greece in the first place, if the former governments were not so generous with public sector jobs, pensions, and banks would not throw loans around. Thanks for the link, Vasili. What Newman forgot to tell in his enthousiastic tale about the dangers of socialism, is that, like in all Latin America, this land, until rather recent, was in the hands of just only a few socalled latifundistas, the rich landlords with 1000s and 1000s of acres and a workforce of half enslaved locals. While that is the Chavista myth, what has been the reality of Venezuelan agriculture. According to Carlos Machado Allison, the go-to guy on Venezuelan agriculture, the biggest landowner in the country is the government. Is controlling the land, controlling production? Do you think the state can reactivate the agricultural sector when it distributes the intervened land? In this country, rural people have always been discriminated against and I think it is impossible to develop in a place where people are not the owners of what they have. If I am not the owner of a farm, I am not going to invest in it. If the land continues belonging to the Government and they offer to end them to me I am not going to produce beyond the conuco(Parcel of land owned by small farmers). The policy should be one of regularizing not intervening the land. The Governors say these measures are to fight against the large farm state and guarantee a basic supply of foodstuffs. The first thing that has to be made clear is that the number of latifundios (large farm states, defined as more than 5,000 hectares) in Venezuela is small. These farms are located in the plains or in Apure; they have hard soils, lateritic ones, with lots of iron and alumina. Communists create their legends, repeat them kver and over. I lived in venezuela for years, and traveled all over the country. My impression: it was a mixed bag. I saw little farms, inherited by several sons from their father, split up until they were marginal. And i saw larger farms, with many employees using modern tractors and large sprinkling systems. What many of you dont get is that venezuela had had a small population and lots of oil. So the country was fairly rich, and it evolved to have a very sophisticated urban class where even a lower class woman could get breast implants. The population grew grafually, outpacing oil income. And the government was socialist. Even what you may think of right wingers (Copeyanos) were socialist. But their socialism was run by dumb politicians, was corrupt, and it could not cope with the oil price collapse in 1986. This led to ibcreasing poverty and the chavista coup atempt in the early 90’s. That in turn dissolved society in acid, even if it was defeated, and led to Chavez’s election in 98. Chavez enjoyed the oil price run up from 1999 to 2012, but wasted or stole most of the windfall, and died in Cuba from cancer. He was replaced by Maduro, a Cuban trained marxist who enjoyed high prices until 2014 (even after the 2014-15 crash prices were higher in real terms than in 1998). But Maduro turned out to be a devil. Hes destroyed everything, and the only solution i see is civil war to force him out. Ola Gringo, gracias for that info from go-to guy Carlos M.A., but, of course, I would have been more interested to know what’s going on on those nationalized or expropriated lands of latifundistas (I wrote about latifundios until recent, but I just see that there still are many, it’s legal to posses uptil 3000 ha, and only the unutilized pieces are expropriated). Of course, the oil boom, the price controls and the cheap imports have just sucked all those small peasant to the Caracas barrios, so, now even where the government offers free land, the campesinos/peasants (because you need to know somethng of land, crops and animals) are nowhere, vanished, due to that easy oil revenu and cheap imports). Another item: the giant latifundios of once were, as you said,situated more in the llanos (Apure,Cojedes a.o.) and lowlands, but my comments above were more meant for the scattered small private peasantries in the montes, the hillside. I know such small farms from other countries (Peru, Colombia), but must think that they still exist also in the Venezuelan countryside. Have a look also at the movie (Youtube?) on these matters, Tierras Libres, Edward Ellis, 2003 ?, where the remaining latifundistas defend their property and legal rights against the claims of the occupying peasants. The local alcaldes and officials, even now seem to be very often siding with those remaining landlords and ranchers, and not with Chavez in the far away capital. And a minor item: where I spoke of bananas above, I meant plantains, a famous staple of the region, not easy to import, but very easy to grow and harvest if you have only a minor plot near the house. To eat with black beans and a chunk of beef (from the llanos and ranches,those immense latino prairies, 1 kg of it in Caracas now: 14 million Bolivar!!!). Good point. The only addition I would like to make is that the urbanization process long preceded Chavismo. After all, “easy oil revenue and cheap imports” were not an invention of Chavismo, but embedded into Venezuelan culture. At least until recent years. World Bank: Urban population (% of total). The WaPo link has some information on that. Prodavinci has an interesting interview with Carlos Machado Allison. Carlos Machado Allison: “Es brutal el atraso tecnológico en el sistema agroalimentario” An excerpt follows. Las empresas socialistas, las cooperativas, los fundos zamoranos,absorbieron un enorme gasto y no producen. El desabastecimiento y la caída en la producción de maíz, arroz, ganado, hortalizas, café, es notoria. Venezuela ha tenido que importar arroz cuando llegamos a ser exportadores, y a importar ganado por una cantidad monstruosa de dinero tras la destrucción sistemática de fincas ganaderas en Guárico y Portuguesa. En Yaracuy, Lara y Aragua ha habido un daño muy grande en la caña de azúcar. Según mis cálculos, que se ajustan bastante a los de Fedeagro y al resto de los gremios, en 1998 la producción agrícola vegetal era de 780 kilogramos por persona al año, y en 2016 fue de 500 kilogramos. Para la seguridad alimentaria se necesitan 800 kilogramos por persona. The socialist companies, the cooperatives, the Zamorano farms, absorbed a huge expense and did not produce. The shortage and the fall in the production of corn, rice, livestock, vegetables, coffee, is notorious. Venezuela has had to import rice when we became exporters, and to import cattle for a monstrous amount of money after the systematic destruction of livestock farms in Guárico and Portuguesa. In Yaracuy, Lara and Aragua there has been a very great damage to sugarcane production. According to my calculations, which are quite adjusted to those of Fedeagro and the rest of the guilds, in 1998 the vegetable agricultural production was 780 kilograms per person per year, and in 2016 it was 500 kilograms. For food security 800 kilograms per person are needed. I will provide FAO documents in support of Carlos Machado Allison,but in a later comment. My previous comment got caught in spam-meter, so I am breaking it up. Here are some FAO stats to back up Carlos Machado Allison. 1) Drop in sugar production. 2) Venezuela changing from a rice exporter to a rice importer. Thanks for the figures Gringo. So, with sugar and rice, tremendous decreases in production. Not so strange where you have foreign currency to import stuff that’s rather cheap on world market, and easy to store and transport and distribute (with subsidies?). And need a lot of organisation (irrigation systems, ingenios ) to produce, the first produce that suffers where the infrastructure and policy is wanting. Probably, the production of plantains, black beans, maize and cassava, produce of the small independent campesino farms, does not have such disastrous declines. Anyhow, a good lesson for the university classes of farm economics of the less developed nations. Because, I think, in Nigeria and Cuba, similar things happen. But, back to the countryside, hillybilly’s territory, the free man’s land, I still think that’s heaven for the starving citizens. Everything, every crop, every economic activity is hurt. The regime has destroyed the country. And we see people starving. Its awful, and it sure would be better if you stop defending this genocide. Probably, the production of…maize,, produce of the small independent campesino farms, does not have such disastrous declines. Maize is in its own special category. At first substantial production increases, and then after 2014, fell off the cliff. From 2013 to 2016, a 40% fall in production. The 40% fall in per capita income from 2013-2018 has made it difficult to purchase items for production, such as seed corn or fertilizer. From what I hear, the decline will continue for 2017 and 2018 production. Is anybody defending socialism or Chavismo here, Fernando? ?, where do you read such things, or is it the strawman?? I am defending the peasantry, the small free farmers. And I hope you know about all those remaining latifundios in Venezuela, often in the hands of foreigners (e.g., El Charcote, 30thousand ha’s). I wonder whether Fidel would have left such farms untouched. Charcote not completely untouched of course, a few 1000 acres of unused lands are redistributed to locals, though, again, I miss figures of the situation right now. Wikipedia says that more than half of the ha’s of the national latifundios is still firmly in the hands of the landlords. It won’t help the food situation much. It’s like war in Venezuela now. Probably, the production of plantains, black beans, maize and cassava, produce of the small independent campesino farms, does not have such disastrous declines. If you sum up the Crop tonnages for Venezuela for 1998 and 2016- after substituting “Sugar Raw Centrifugal” (processed crops) for sugar cane (BIG tonnage difference), you don’t get the same tonnages as Carlos Machado Allison, but you DO get the same per capita decline of 33% from 1998- 2016. As you can see, Gringo, the decrease of beans and plantains (peasant crops) is by far not as disastrous as that of rice, the country practically stopped production of it, and (if we may believe the statistics, see later) maize even increased substantially after the Land Reform laws of 2001 (maybe because price incentives? skip to another crop?). The decrease of cassava of Carlos, I distrust, what do other sources say? Crops like cassava, but also plantains, fall beyound statistics, who is going to estimate or measure what peasants grow in their farms and sell locally? In all those backward mountain areas without proper roads? Nevertheless, it’s clear that also such small crops must decrease due to price controls and the Dutch Disease (use of money from fuel or gas exports for social programs), the large urbanisation as a result in V. just means disappearance of farmers and peasants. But, who can tell me why citizens don’t FLEE BACK to the LAND and the SOILS that provide food for work (and just rather simple work, every gardener can do)? Independent enquete commission: 4 million. With other words: what is the value of Venezuelan statistics? Or other figures? Also from Cuban Fernando, I expect very few trustworthy figures on food production and peasant agriculture, or from figures on fleeing back to the countryside. Though, he must know more about all those agronomists and cooperation specialists that came to “help and assist” Venezuela in their disastrous land reform programs!. Charcote not completely untouched of course, a few 1000 acres of unused lands are redistributed to locals, though, again, I miss figures of the situation right now. Did you ever read the links in this article? “Not completely untouched?” Rather completely touched, according to the WaPo link that Newman provided his readers. In Venezuela, Land ‘Rescue’ Hopes Unmet, Washington Post, 20 June 2009. Among the once-productive farms put out of business earlier this decade was this 33,606-acre ranch in Cojedes state owned by the Vestey Group, a British company. El Charcote used to turn out 3.3 million pounds of beef a year, making it one of the country’s top 10 producers. Today, the 13,000 head of cattle that once roamed here are gone. The small farmers working the property have a few cows, but those animals, and the small corn patches here and there, are mainly for personal use. New farm machinery, painted the government’s trademark red, gathers dust in a lot on the outskirts of this town. El Charcote se fue a la…. Venezuela‘s current crisis is due to corrupt crony populism, not to socialism. 2. Its government owns much of the economy. 1. When the Venezuelan government says that Venezuela is socialist, we should analyze this statement with the same skepticism as when it claims to be democratic and anti-imperialist. Until evidence is forthcoming, we have no grounds to believe it. 2. Austria’s government also owns most of the economy, namely all big banks, most heavy industry, and so forth. But nobody currently calls Austria “socialist”. Moreover when Venezuela began its nationalization binge in 2003, it was a purely political move intended to disempower local and foreign capitalists who were intent on undermining Hugo Chavez’ rule. It was a piecemeal expropriation and no central planning structure emerged. The new state enterprises were staffed by Chavez’ cronies chosen for their loyalty, not their competence. Consequently there seem to be no sound reasons for calling Venezuela “socialist”. Therefore the critique of socialism offered by Mr Richter, Ludwig von Mises, Friedrich Hayek et al. are irrelevant to Venezuela. It is socialism. All i can add is that decent people around the world should make sure these socialists cant rewrite history, because this has to be known, written in text books and taught to your children. Dont ever ever let them take over your countries, do what you have to do to stop them. They are fanstics, insist on inflicting pain and misery over and over. All they touch turns to rubble, they destroy society. If you are religious pray to your God that these people never get power over you. Please state your reasons for claiming that Venezuela is socialist, while denying that Austria is socialist. An economic system without economic planning is not socialist. Venezuela has no economic planning, so it is not socialist. There is much to criticize about the Venezuelan economy, but exercising such criticism is not critique of socialism. The central planning structure that emerged failed. To your cronyism point: that is the point. This is what always occurs in socialist countries. I beg you to present evidence to the contrary. I cannot fathom how the evidence is not forthcoming. I think you’re essentially engaging in the no-true Scotsman fallacy: you don’t see socialism because Venezuela is not a Utopia. If it walks like a duck and quacks like a duck, it’s a chicken? You claim there was a “central planning structure”. What was its name, when was it founded, who was its director? What were the names of the economic plans issuied by this central planning structure, and in what years did these economic plans begin and end? Your own Hausmann called Chavez a socialist (from 2007 onwards, not at the start, where he left the economics, agriculture and enterprises on its own), but from then on started nationalizing banks, telecom, farms, supermarkets and the like. Though not very clever planning, I would call such moves rather socialistic! Chavista Venezuela, Sandinista Nicaragua (1979-1981 on), and Allende’s Chile (1970-73) all have had sharp declines in agricultural production. In addition, Cuba’s milk production from 1961 on lagged greatly behind that of the rest of Latin America. While neither Sandinista Comandantes nor Allende officials nor Cuban officials were completely free of corruption, their level of corruption was much smaller than corruption in Chavista Venezuela, and far from the main reason for economic debacle. What all four countries had in common was a Marxist ideology. Chavista Venezuela, Sandinista Nicaragua, and Allende’s Chile featured price controls, usually with high inflation, and a lot of “land reform.” Overweening government control was the feature in common in Cuba. Cuba’s having Soviet and Chavista sugar daddies meant it didn’t have to suffer inflation. 4) Compare the increase in milk production from 1961 to present for Cuba and Latin America. From 1961 to 2016, Cuba’s production of fresh milk increased 75%. From 1691 to 2016, Latin America’s milk production increased 321%. Dividing 2016 production by 1961 production: 1.74 for Cuba, 4.21 for Latin America. Repeat after me: NOTHING TO DO WITH SOCIALISM. NOTHING TO DO WITH SOCIALISM. As they say in Venezuela, tell me another cowboy tale. (Dime otro de vaqueros.) Also known as tall tale or fish story. Perhaps you want to close your eyes and ears to the above, but to me these examples show me that Marxism/Socialism is a disaster for agriculture. While one may not call Venezuela as Marxist as the other countries, it shared “land reform” and disincentives to production, such as price controls. I’m Cuban, lived there under communism. After the land was nationalized by the Castro regime, fresh milk disappeared. Canned milk was allocated only for children 6 and under years old, in inadequate amounts. My mom was very savvy, she knew how to get black market milk, a dangerous trade which could land her in jail, but she knew my sister and I needed it so she went for it. I believe what we see in these comments sections is peppered with propaganda, cut and paste, prepared by the Castro regime, because its very uniform in style, and the lies and distortions used to defend these red regimes tend to be very similar. To the author and Quillette: if you want to write another article about Venezuela feel free to contact me (find me on twitter), and i can give you both spanish sourced information as well as put you in contact with individuals who used to support chavez and are so upset theyll risk their lives and allow themselves to be quoted openly. I, on the other hand cant give you my full name although i suspect by now the cuban secret police knows who i am. I wrote nothing about “sharp declines in agricultural production”. Besides, the declines in production you claim did not occur during export booms in Chile and Cuba. I wrote that the surface of land devoted to farming shrank. A decline in production can have many causes. Planned economies are indeed often inefficient. But planned economies do not automatically reduce the amount of farmland they cultivate in response to surges in food imports. Prompt reductions in the amount of land farmed in response to surges in food imports are typical of market economies. Your ostensible rebuttal of my argument is based on simply changing the subject matter of the discussion. Planning in cities with factories and a workerclass is, of course, easier than in the rural areas, especially where these are mountainous and full of wasteland and wetlands (llanos). Even in Russia, communism (even more socialist than socialism ) started in the big cities, and only after years (after the new economic policy,kind of compromise, failed) the land was following in the planning process: a disaster, because peasants and farmers actually don’t fit in the philosophy of industrial capitalists and the poor worker classes. BTW, how do you see the Israelian kibbutzim project? Socialism? I wrote nothing about “sharp declines in agricultural production”. As I wrote that, and I never claimed that you had written that, I have no idea what your point is. I wrote that the surface of land devoted to farming shrank. While my “sharp declines in agricultural production” was not written in response to the above, you did make such a statement. As you apparently want me to reply to it, I will do so. By your logic, the fact that “land surface devoted to farming shrank swiftly” from 1995 to 2010 was an indication that Venezuela was NOT a planned economy. FAO data informs us that in that same time period the amount of Venezuelan land devoted to crops increased 20%- from 1.698 million hectares to 2.045 million hectares. Which is a far cry from “shrank swiftly.” So by your own logic, Venezuela IS a planned economy. You have reading comprehension problems. My comment about “sharp declines in agricultural production” was NOT written in response to your comment about “surface of land devoted to farming shrank,” but to your comment that began with “Venezuela‘s current crisis is due to corrupt crony populism, not to socialism,” a comment which makes no statement whatsoever about amount of land devoted to farming. Besides, the declines in production you claim did not occur during export booms in Chile and Cuba. Which just might suggest to you that my comment about “sharp declines in agricultural production” had NOTHING to do with export booms. From 1961 to 2016, the amount of land cultivated for crops in Cuba fell from 2,054,422 hectares to 1,491,106 hectares, a figure which is more in line with my theory that Marxism/Socialism destroys agriculture than with your theory that export booms in capitalist countries destroy agriculture and that Socialism doesn’t. See my previous comment for link. For those that say but the USSR, China’s “revolution”, Venezuela or any other “socialistic” system is not THE ONE TRUE SOCIALISM then I say but our horrible “capitalism” is not TRUE CAPITALISM! Listen, it boils down to this; if there is a sector in the economy that is currently ran by private owners and the government comes in and takes it over that is coercive socialism, straight up. If the government does this with ALL sectors and closes it to the outside market than it is now on its way to becoming a totalitarian failed state. Every time, no exceptions. I’m sorry, but no amount of rationalizing or wishing will change this. Also, I don’t know if ya’ll noticed this but here in the U.S. “we the people” actually do run the show. Of course corporations are corrupt and money is in politics but in this country we have almost 30 million small businesses, a million of which are minority owned. These are SMALL businesses, that’s not including medium and large sized businesses. This is WORKER owned! These small business owners are not the petit bourgeois of old (those are college professors) these business people are the working class they own the plumbing services, autobody shops, construction companies, house builders, retail shops, restaurants, mechanic shops, small & large grocery stores, engineering firms, law offices, car dealerships, rental companies, trucking companies, mobile food trucks, floral shops, massage parlors, doctors offices, gyms and that is just in my small town of 50,000 people! We Are The Workers! We Are The People! At anytime, you, “THE WORKER” are totally free to leave and go anywhere else. You can open up a jewelry shop like 3 women have on Main Street in my hometown. I live in a red state in flyover country, it’s a college town but it’s ag based. A few years ago a few guys moved back home and opened up a micro-brewery that is doing phenomenally. This is the owner/worker society that you are talking about! Go outside the academy and look around, I know the rust belt needs help but most of us are doing great. We are entrepreneurs, we’re not Bill Gates or Sam Walton but we OWN OUR OWN MEANS OF PRODUCTION. This is the workers revolution of your dreams. If there is something you’re dying to do we have all kinds of options set up to help you get there. Of course it’s not handed to you and you will have to earn it but it’s totally doable. This is not utopia, it is a fact. But we have no need for the intellegentsia to tell us what or how to do anything. The intellectuals have always been useless to the business and working class in American society. We have no use for the intelligent vanguard, none! We never have and this, my friends, is why the socialist vanguard in academia have real hatred for the working and business class. It’s because they are parasites that only survive in a capitalistic market society. They are mostly upper middle class, they sit around in their comfy classrooms while thinking of ways to dismantle the very society that allows them to exist. They should just go open up a food truck and save the rest of us the headache of suffering through their tiresome protests! But, KDM, I hope you realise it’s mainly a passtime for middle class academians? And nothing serious (because no influence at all) !! You are right KDM, neither true socialism, neither true capitalism (Friedman, Hayek) is the answer. The neo-liberal exigencies in policy (not only in Venezuela before Chavez, also in all African countries) resulted in economic and social disasters, or overreaction and flight into monocrop socialism. But, what we really need, everywhere, is the experienced bartender who knows how to mix and serve the right cocktails (something like the Rheinland model in NW Europe, Sweden, Germany). The neo-liberal exigencies in policy (not only in Venezuela before Chavez, also in all African countries) resulted in economic and social disasters..
For the most part, in the 19901s, Venezuela kept its government-owned enterprises: PDVSA, iron, steel, aluminum and electricity generation. Hardly neo-liberal at all. The main problem with economic growth in Venezuela in the 1990s was that the price of oil was lower than in the previous decade. In 1998, Venezuela sold its oil at an average price of $10.57/BBL- the lowest average yearly price in a generation. As Juan Bimbo, the average Venezuelan, tended to judge his government by the amount of oil revenue it distributed, he had a decidedly negative view of the Venezuelan government in 1998. Thus the election result. That being said, Fourth Republic Venezuela in 1998 with $10.57 oil was decidedly better off than Chavista Venezuela in 2018 with ~$60 oil. But, what we really need, everywhere, is the experienced bartender who knows how to mix and serve the right cocktails (something like the Rheinland model in NW Europe, Sweden, Germany). As your statement about “neo-liberal exigencies” in Venezuela indicates you know a lot less about Venezuela than you assume you know, perhaps you shouldn’t snark like that. But, who can tell me why citizens don’t FLEE BACK to the LAND and the SOILS that provide food for work (and just rather simple work, every gardener can do)? For the most part, the information has already been provided in links and discussion. You can lead a horse to water…..
Recall the data I provided about Venezuela having 88% urban population in 2000. A generation and more removed from rural areas- where are they going back to? In this country, rural people have always been discriminated against and I think it is impossible to develop in a place where people are not the owners of what they have. If I am not the owner of a farm, I am not going to invest in it. If the land continues belonging to the Government and they offer to end them to me I am not going to produce beyond the conuco (Parcel of land owned by small farmers). The policy should be one of regularizing not intervening the land. There are problems with title to the land. “I say to all who say they own land: In the first place, that land is not yours. The land is not private. It is the property of the state,” Chávez said last month on an episode of his weekly television show broadcast from rural Barinas state, where he grew up. If the land isn’t yours,but belongs to the state, you aren’t going to work your hardest on that land. Dreaming of a new life, Ramón Barrera came to El Charcote, a vast farm here in northwestern Venezuela, several years after President Hugo Chávez’s populist government had expropriated the property from its longtime owners and begun distributing parcels to small farmers like him to work. Six months after he arrived, Barrera’s dream is still just a dream — his 37 acres are fallow, so he spends his time feeding grain to nine scrawny pigs. He and other farmers trying to earn a living on the farm’s sunbaked expanse said the technical help they had been promised never materialized. Not to mention the problems of getting rural produce to the city. A further issue with going back to the land is that criminals and criminal gangs are found in both rural and urban areas. Stealing of crops and livestock is rather common, I have read. I can follow all your reasoning, understand most, and can even agree. There is a thick report to write about the situation and the possible measures to stop it. And I don’t think that somebody turns up here that knows about the movements within the country, also Fernando, who is more knowledgeable than others, can’t do the research, or spotting local journalists or bushcrafters to find out. So, I fear, I will not be informed about these things, whether, e.g., at least, say, 50 or 100.000 Caracans with ties with small familyfarms have returned to the land to escape hunger. Also in Greece it was not more than 4% of total population. I have lived and worked some 20 years in countries where land reform was an issue,always hotly debated. The ejido system in Mexico, the FARC in Colombia, the distribution of small plots to peasants by bying out (by he UK) the former landlords/cattle owners on the Kenyan highlands, a complete failure (not unlike that redistribution of El Charcote, also a cattle farm not suited for crops on most of the area). What I said above is outdated, the farm has been sold in the meantime to the state, but the owners (British landlords) still own 1000s of acres elsewhere. You mentioned the term -conuco-, a small plot for self supporting mainly (often by burning the bush before planting), called chacra in Peru, this is exactly what I was heading at, and NOT MORE THAN THAT, survival only for a period, so no electricity or tractors please, keep it small. What I read today in my Google search -Necesitamos credito, tractores, apoyo tecnico…..-, that stuff thus, and you know it’s not going to work, expectations that ask for a long term effort and coordinated organisations, not possible in the chaotic Venezuela of the last 15 years. But I stay interested, because of my history. Another sentence I read today – Como es posible que estemos importando caraotas- (Hugo Chavez himself), yes how is that possible!! To have to import the ordinary beans for a simple local dish, in such a resource rich country!! For me no surprise at all! Nigeria does the same! Thanks for discussing with me about these things! ……a la chingada, was that what you meant Gringo?? Hahaha, I feel being back for a short moment!! Again, my history is what counts here: Vera Cruz, Mexico (10 years, great time). Even platano there isn,t what it is in Venezuela. And they don,t know what caraotas are. But what they eat is the same. Part of the problem for those familiar with other countries in Latin America is that Venezuela’s century as a petrostate has done much to differentiate it from other countries in Latin America. Which means that the assumptions brought from other Latin American countries to Venezuela do not always work for Venezuela. The state, with its control of oil revenue, has long had an out-sized influence in Venezuela compared to other countries. It has been remarked more than once that a “right winger” in Venezuela would be a left winger elsewhere. The assumption in Venezuela is that it is a “rich” country that should distribute its “wealth” to the populace: a rentier attitude pretty much from top to bottom. Unfortunately for the Venezuelans, not as rich as they assumed- even before the Chavista debacle. With a population of 5 million in the 1950s going to over 30 million 6 decades later, the oil wealth was split many more ways. With other words: what is the value of Venezuelan statistics? Or other figures? As Venezuela Collapses, Children are Dying of Hunger. The World Bank gets its data from country’s governments. Thus, what information the World Bank provides on Venezuela, comes from the Chavista government. World Bank: Venezuela: Number of Infant Deaths. The government bulletin : 11,146 Infant Deaths in 2016. World Bank reports 8,400 Infant Deaths in 2016. Conclusion: the Venezuelan government provided false data to the World Bank on Infant Deaths for 2016. Note that when the 11,146 infant deaths in 2016 in the NYT article is divided by 1.3, we get 8574 Infant Deaths in 2015, compared to World Bank data of 8596 Infant Deaths in 2015, which considering round-off errors, indicates the NYT data is accurate. I am reminded of pointing out to PSF (Pendejos Sin Fronteras) that World Bank data showed that economic growth in Chavista Venezuela from 1998-2013 was much lower than the rest of Latin America or the rest of the world, for that matter. The PSF reply would be that the World Bank, being a capitalist organization, would publish false data damaging to the Chavista government. Were one to go to the website of Venezuela’s Central Bank, one could find the same data on economic growth that the World Bank provided.Repeat after me: World Bank gets its data from respective governments. Which is why there is no World Bank data past 2015 on Veneuzuela’s economy. The Chavista government hasn’t provided that data- too embarrassing. Regarding skepticism about FAO statistics, I would point out that the FAO, like the World Bank, gets its data from the respective governments. There has also been well-founded suspicion in the past that the FAO – at least some parts of it- has been a water carrier for the Chavista regime. I refer you to Gustavo Coronel’s blog. Advanced Google Search @ Gustavo Coronel’s blog: food and agricultural organization. Small additional remark: Dijsselbloom also admitted that in Greece, the whole democratic system was bypassed (under strong pressure of North European nations) to save the EU and the currency (except on some minor aspects). Voters are always the boss, he said, but not always very knowledgeable. So, the democratic socialism of Bolivious is not something logical or harmonious. Instead, it is a big challenge! Don’t confuse them with pseudo-socialist practice. Indeed , santoculto, what is pseudo-socialist? And what is genuine socialism? Or genuine capitalism? Colonialism? Imperialism? I wouldn’t know. Above I asked, is the kibbutz system in Israel genuine socialism? No answer, of course! With the hyperinflation all local Venezuelan wealth has been wiped out. The fear I have is the situation in Venezuela may go into a genocidal phase. These socialist governments tend to sometimes do that. The question is what to do if the genocide happens? Why organize a genocide James, the people flee themselves already, now already more than 4 million abroad, as estimated by some sources. Pol Pot of Cambodja forced the citydwellers to settle in the rural areas and work in the fields. That could also be a solution(in a somewhat milder form) for Maduro, because where you miss foreign exchange to buy maize meal, rice, wheat, beef and sugar, you might as well try to let the job of farming be done by the Caracanians, they have lived too long now a freewheeling urban life. Venezuela is the only South American nation importing its staples ( Cuba being the Caraibian one). Here I am again. Thanks to Quillette, I heard more about the Venezuelan crisis and learned a lot of Gringo, Fernando, Bolivious and, via Google,also of the history and backgrounds. For me, having worked longtime in Mexico and Peru, an eyeopener. And, a pity that interesting reactions on Quillette then are not resulting into something more solid, or concluding, some katharsis after all. -After corn flour and pasta disappeared on the shelves of the supermarkets, these necessities were soon replaced by vegetables, fruits,plantains and potatoes, in which the country still was self sufficient-. This is what I suspected already (@Gringo), but now saw it as expressed by a knowledgeable source. The farm of Arria, La Carolina, in the state of Yaracuy, having 300 Jersey cows and other cattle, was expropriated in 2010 by the ministry of agriculture on the grounds of not being used, but being ” Idle and fallow” ( a reason to expropriate, thus different to situations in Russia and elsewhere, where the farms were simply and without any reason expropriated). Arria himself called the seizure of the ranch: “pillage and ransacking”. Background: the seizure was a reaction on critical remarks on Chavez’s policy. O.K., I think then, if things are like that, what is the use of discussing about socialism or capitalism?? Venezuela was stumbling as well under neoliberal policies (Perez a.o.) as under pseudo-socialist ones (Chavez, Maduro) This is just children’s play, and only possible because of ample export earnings due to petro dollars (and credits, all in the good times of course). After corn flour and pasta disappeared on the shelves of the supermarkets, these necessities were soon replaced by vegetables, fruits,plantains and potatoes, in which the country still was self sufficient-.This is what I suspected already (@Gringo), but now saw it as expressed by a knowledgeable source. But the “replacement” of plantains, potatoes, et al was not adequate to compensate for the loss of pasta and corn. In 2013, Venezuela had domestic supplies of ~130 kilos per capita of maize. That would indicate that domestic production of potatoes or plantains -which would add up to about 30 kilos per capita- would have been far from able to replace them. From 2014 to 2016, Venezuela’s Cereals production- maize and rice- went down about 60 kilos per capita. Neither maize/corn imports nor increased potato or plantain production made up for the deficit. Overall, food supply in Venezuela is greatly reduced in recent years, as most Venezuelans have reported substantial weight losses in the last two years. You WERE aware of this, were you not? Venezuelans report big weight losses in 2017 as hunger hits. CARACAS (Reuters) – Venezuelans reported losing on average 11 kilograms (24 lbs) in body weight last year and almost 90 percent now live in poverty, according to a new university study on the impact of a devastating economic crisis and food shortages. The annual survey, published on Wednesday by three universities, is one of the most closely-followed assessments of Venezuelans’ well being amid a government information vacuum and shows a steady rise in poverty and hunger in recent years. Last year, the three universities found that Venezuelans said they had lost an average of 8 kilograms during 2016. This time, the study’s dozen investigators surveyed 6,168 Venezuelans between the ages of 20 and 65 across the country of 30 million people. That makes two years of massive weight losses. That hardly sounds as if plantains and potatoes are providing an adequate replacement for reduced supplies of corn or pasta, does it? “Stumbling under neoliberal policies”- I have already pointed out the fallacy of this contention.For one, the “neoliberal policy” of privatizing telecom was very successful in Venezuela. Hardly “stumbling” at all. Second, overall it is rather fallacious to label CAP2 -1998 as “neoliberal” because Venezuela remained a dirigiste government which maintained government ownership and control of oil, iron,steel, aluminum, and electricity production. Had Venezuela been as “neoliberal” as you claim, those would have been sold off. In addition, while Venezuela was “stumbling” in the 1990s, that is hardly comparable to the collapse of recent years. Infant Deaths rose 30% in 2016. FAO data supports Carlos Machado Allison’s statement that per capita plant-based agricultural production fell ~35% from 1998 to 2016. If you are going to characterize Fourth Republic of the 1990s as ‘stumbling,” it is not accurate at all to use the same to describe the utter collapse of Venezuela in recent years. Why don’t we fly together to Venezuela Gringo, and stroll through the hinterlands to see? I saw in my Atlas that about half of the country is mountainous (south of the Orinoco and near Maracaibo), good Conuco land, good for all kinds of root crops, (sweet)-potatoes and others (was there not something like arracacha also?). Shortages of food in Caracas I nowhere denied, I only wondered about the alternatives, like Christina and others did, I really hope she will answer here, I mailed her yesterday. Best greetings! A final one, because of my passion for the subject, and because of a feeling of missing relevant facts. Yesterday, searching for more details of this discussion, I found what I was looking for, in -Venezuelanalysis-, a piece of Ana Felicien , Christina Schiavoni a.o. on -Reconnecting agriculture to our cultural base…..-, 4 sept 2018. – Peope now can’t find anymore the Kellogg’s ready mades, Campbell’s soups, Kraft cheese, Quaker Oats, canned and frozen food and other processed and imported junk food, because the shelves of the supers are empty, and instead eat more plantains,cassava (sweet) potatoes vegetables and other (healthy) stuff from the -conuco-, the family-plots inland. There is even a Feria Conuqueira (read in in another, earlier story by the authors) in Caracas where these products are sold (transport is still very cheap due to low fuel prices). Urbans grow crops in patios and on their roofs, the rural population also turns again to agriculture, and are INCREASINGLY JOINED BY URBANS to work in small fields. Freshly ground maize has replaced the processed and precooked maize meal, and granny’s maize grinders are dusted off to substitute the missing processed stuff. This is what I was looking for. What’s also clear to me: this trend is a turn back to pure capitalism, because, no more need for much infrastructure, credit, electrification,cooperatives and structures, commercial seeds and fertilizer, planning and knowledge from above. But, though capitalistic, it’s all Chavista, because Ana and Christina are Chavista researchers, there is even a governmental institute working on family farming and agroecology, in Barinas, and movements such as mano a mano, semillas del pueblo, and other such initiatives. I really was surprised by all this, but don’t think there is much interest in it on Quillette, abstract ideology (socialism vs capitalism) of course always is more appealing to the brains and the hearts than the reality of the food situation somewhere. Venezuelanalysis is a propaganda tool for the Chavista regime. If you want Chavista propaganda, go to Venezuelanalysis. If you want facts, go elsewhere. I know Gringo, but the writers are not, one of them even is attached here to the University, I’m just now going to mail her, and ask about the connections of that Barinas station with Brasil. And he trend of the article was not positive or critical about the chavista philosophy, but rather neutral, in fact, conuco family farms escape the real Chavista program, they dont need oil revenues or state help and planning. Where they write that urbans are turning to agriculture, in fact, this goes against Chavismo, because they like planning and influencing the masses of the poor. They like = Chavismo likes.